THE last bastion of cheap petrol, the Middle East, is embarking on a green - or perhaps electric blue - revolution. Tumbling oil prices have given the region's economy a black eye in recent years, so the Gulf states are working hard to spread the word on sustainability. 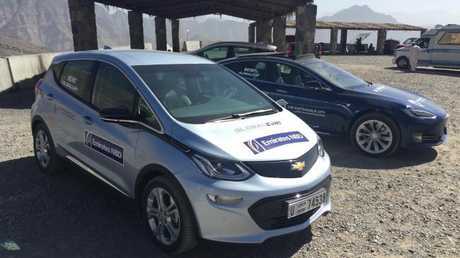 In a bid to encourage electric vehicle use, a convoy of nine electric cars travelled more than 2000km across the United Arab Emirates and Oman, recharging only at public charging stations en route. 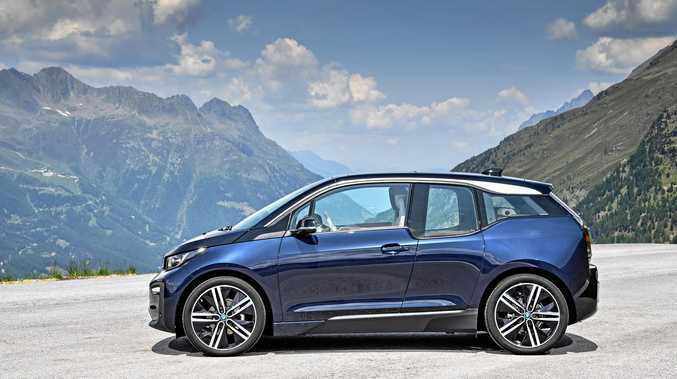 The nine-day Electric Vehicle Road Trip attracted Teslas, Chevrolet Bolts and a lone BMW i3 and marked the installation of 18 electric vehicle charging stations which were officially opened along the way. Teslas on the 2018 Electric Vehicle Road Trip Middle East. "The electric vehicle market here has developed significantly in the last 12 months, particularly in the UAE," the event boss Ben Pullen. 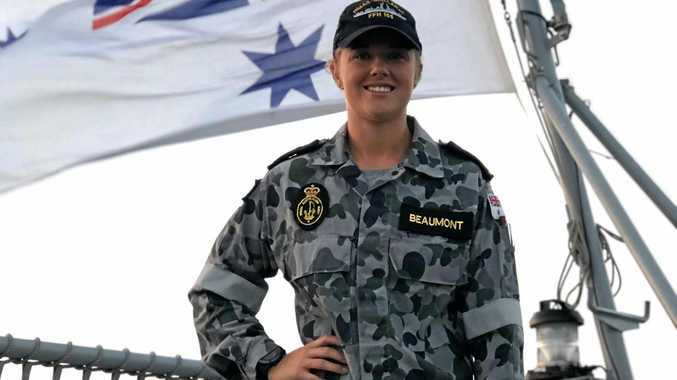 The fleet covered 2000km over a variety of terrain from the Abu Dhabi deserts to the Omani mountains and the coastline of the Northern Emirates and tackled the daunting 1934m climb of the highest peak in the UAE, Jebel Jais. "It's fantastic to see that there are other forward-thinking governments and industries in this region such as Oman who are working on smart city development with plans for electric vehicles in the near future," Pullen said. Charge time: Chevrolet Bolt and Tesla on the nine-day road trip. "We proved that you can drive long distances in an electric car across the Middle East without compromise." I took the wheel of a Chevrolet Bolt EV for the final days from Fujairah to Dubai via Ras Al Khamiah and drove it as I would any small car, cruising at 120-130km/h with three passengers, luggage and the aircon running. The Holden Barina-size hatch does zero to 100km/h in 7.5 seconds and has a range of 400km. We set out for the day with 325km range indicated, heading for Jebel Jais - and it regenerated an extra 10km worth of charge coming down the mountain, leaving me with 157km to get to the hotel by the end of the day. We arrived with 104km remaining after six hours. Following an overnight top up, we drove the final three hours into Dubai with 150km left at the finish line. "The demand for electric vehicles is expanding each year and the Middle East is well positioned to be a strong market for low emission cars," said General Motors International urban vehicle chief Gary West. EV Charging Station at The Sustainable City, Dubai. "This event has been a big step forward in bringing EV technology to life in the Middle East. It set the foundation for worry-free electric motoring across the region." 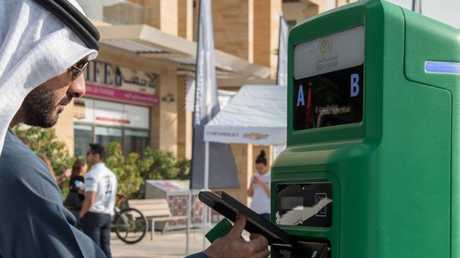 Analysts Deloitte Middle East, in a report for the Saudi Energy Efficiency Centre, reckons driver of a small, four-cylinder car could save significantly by switching to an equivalent EV. In 2014, almost 830,000 vehicles were sold in Saudi Arabia. On Deloitte's estimate, if EVs accounted for a quarter of sales over the next four years, fuel savings would far exceed $US200 million and eliminate millions of tonnes of carbon emissions. Much faith has been placed in the Middle East to lead with renewable energy following a decision by the International Renewable Energy Agency to establish its global headquarters in Abu Dhabi.